Virgin Money has launched a new bonus miles offer with its life insurance policies. Until 31st January 2019 Virgin Atlantic Flying Club members who take out a life insurance policy can receive up to 20,000 Flying Club miles. Virgin Money life insurance policies come with various perks including access to Virgin Money lounges across the UK. Depending on your health, and based on experience with Tesco Bank life insurance promos in the past, you may be asked to have a medical examination before being accepted – just in case you were thinking of doing this purely for the miles! That said, whilst this is a good return if you are looking to get life insurance, it makes little since buying purely for the miles. The closing date for applications under this offer is 31st January 2019, so you have over two months to see how it compares with your current policy. Not 10,000 miles for 80p/ month then? Another sad indictment of loyalty scheme devaluation. Had forgotten about those..when do we expect them to appear? Late Feb? (6 months + 60 days) ? Haha not a devaluation, just a dose of reality. How Virgin Money thought they could offer 10,000 points or £100 worth of points for my investment of £8.24 was always too good to be true. Indeed if the timings are the same, it looks like we won’t get our 10,000 until Feb? I took mine out on the 21st June …. It’s a travesty Harry, a travesty. A shame that you can’t like comments! Lol @Cat. That’s the response his comment deserved. Quick request for help/info if anyone knows. I booked a Reward saver flight for today (30 mins ago) which I no longer need, I was under the impression you had a 24hour grace period for a full refund on avios and the taxes I paid? When I looked at cancelling it said I was due 0 cash refund. Is this correct? Just thinking as the flight is for today it might not count for the refund or perhaps it would be a BA service charge? It’s 24hrs grace in the period after you make the booking. Thanks Shoestring, so considering I made the booking at 9am, i should expect to see the 17.50 in the cash refund part too? But you can change it for free to another date within 24h of booking. That little tip I got from the German office of BAEC. Does anyone have any latest info from Hilton CS regarding how points are not credited recently since the IT update, just wondering if anyone been told roughly when points will start to credit again. I used online chat and they manually added them. I called up today to check before I applied for the premium Virgin Atlantic credit card as I already hold the basic. 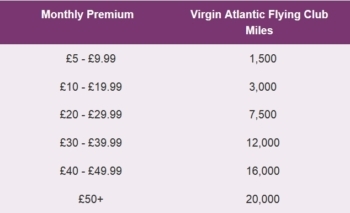 They told me that I can only earn a SINGLE upgrade voucher in any one year, regardless of whether I hold one or both cards, and that the membership year (May for me) remains the same for both cards – the upgrade voucher is given by Virgin Atlantic, not virgin money. Rob – Would you agree with this statement, seems a bit of a let-down and differnt (I think) to what you advised previously? First I have heard of it. Will reach out to VA on Monday but may take a while. Has anyone noticed that there is virtually zero availability for all VA U/C inbound mileage seats ATM? Are they trying to push traffic to Delta? I am the most flexible person in the world on dates and destinations – but even I cant get a decent U/C redemption for two for next summer! (apart from on one of the awful Air Berlin 200s which I refuse to fly on again). It used to be so easy.